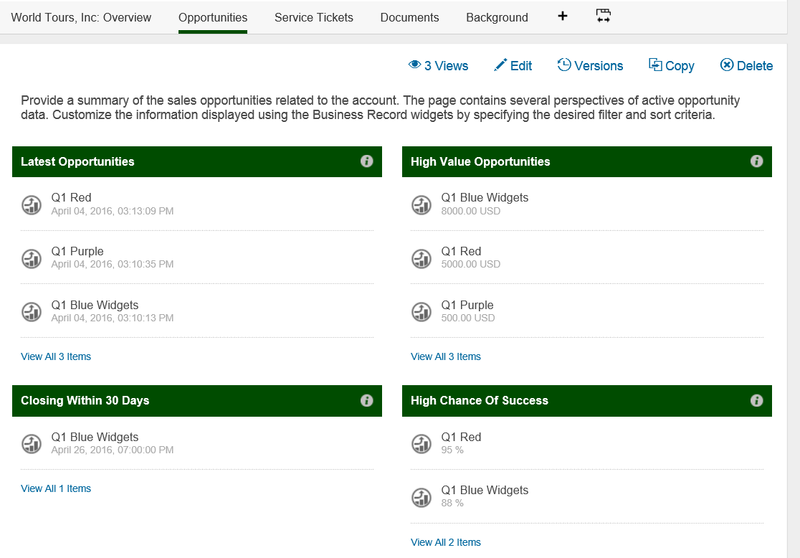 When integrating SAP Hybris Cloud for Customer with SAP Jam Collaboration there are standard filters used when viewing objects such as Opportunities and Service Tickets. For Opportunities, standard examples include: Latest Opportunities, High Value Opportunities, Closing within 30 Days, and High Chance of Success. This blog describes the common queries and how you can add your own filters. To view or edit the filters go to the SAP Jam Collaboration admin console and do the following. Navigate to Admin → Integrations → External Applications. Find the name of your C4C environment. Select the Action dropdown. Choose Manage Record Types. 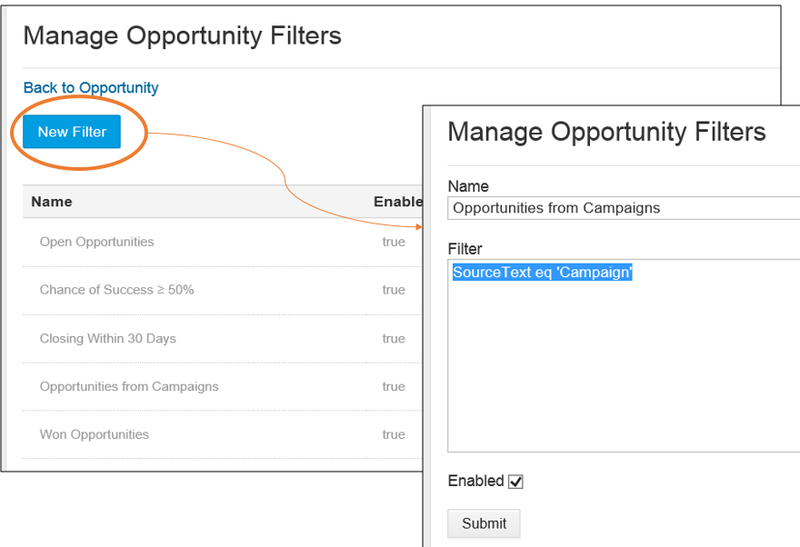 Find the desired business object (for example Opportunity) and choose Filters. From there you can add a new filter or edit existing filters. Before adding a new filter, you need to know the fields from the OData API. 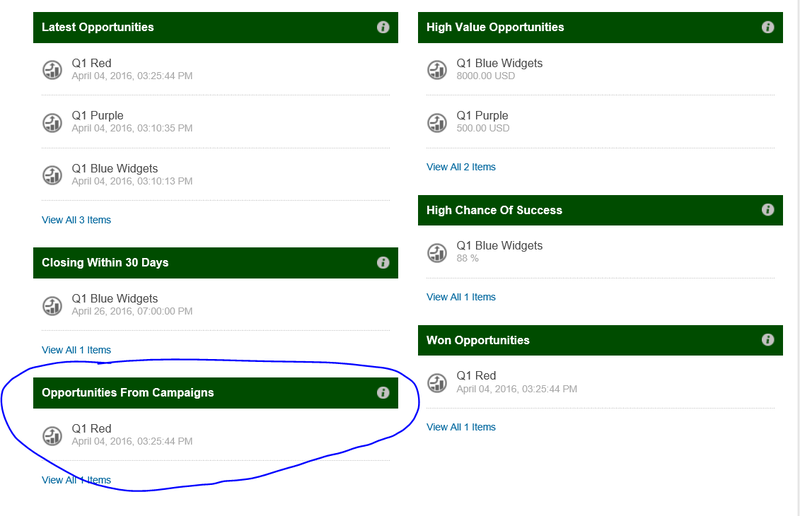 For example, you want to add a filter for Opportunities generated from a Campaign. 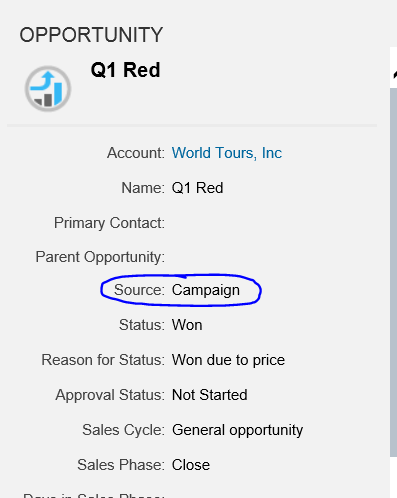 In the example below, the opportunity is ‘Q1 Red’ and the source is ‘campaign’. Next, look at the OData service. You can view this in the Manage Record Types configuration in the external application settings. These settings are found in the administration console of SAP Jam Collaboration. Navigate to Admin → Integrations → External Applications. Find the name of your C4C environment. Select the Action dropdown. Choose Manage Record Types. Select Edit for the Opportunity record type. 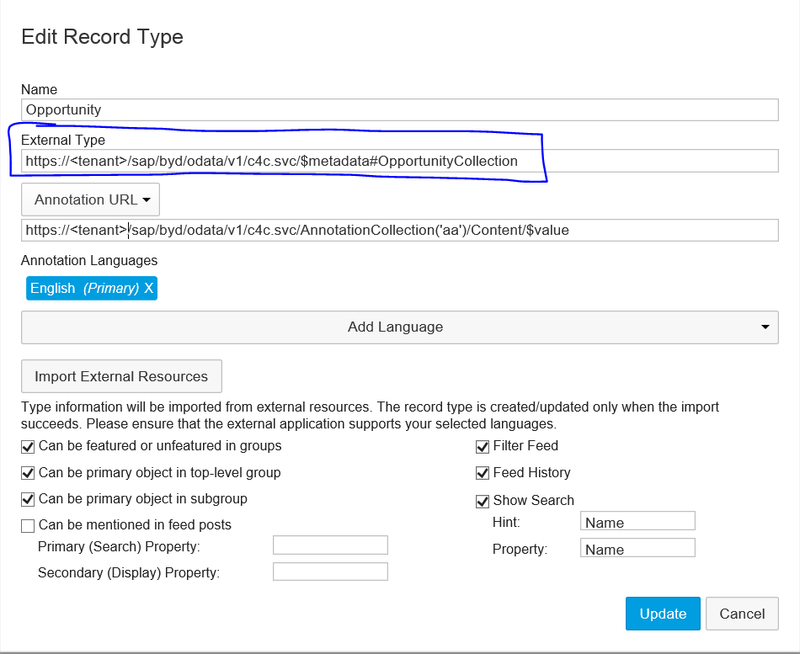 Copy the URL address in the ‘External Type’ section outlined below (https://<tenant>/sap/byd/odata/v1/c4c.svc/$metadata#OpportunityCollection). Paste it into a new browser tab. When looking at the OData service, search for the field you want to filter on. When searching for Source, you notice Source and SourceText. 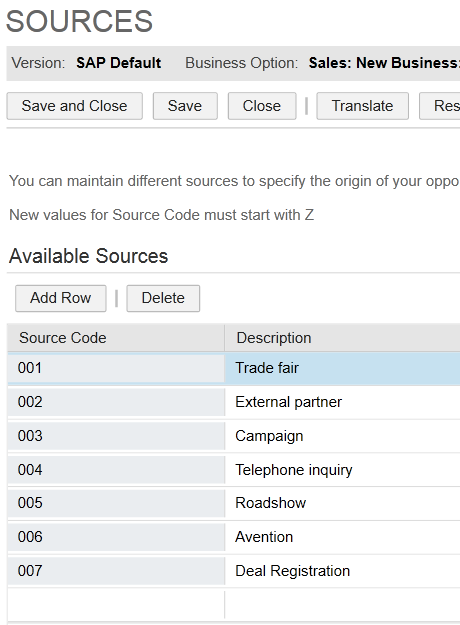 If you use the ‘Source’ field you will need to know the codes for each source type. Code values normally come from the Business Configuration – Fine Tuning in C4C. 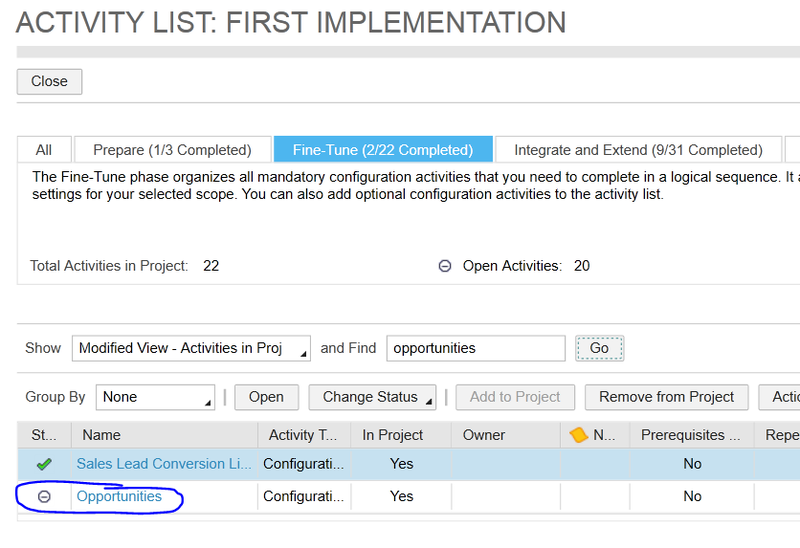 You can find the code values by navigating to Business Configuration → Implementation Projects → Open Activity List. Then search for Opportunities in the Fine-Tuning phase. Drill into Sources and there you can find the codes. In this example, we will use the “SourceText” field to type out the name of the source in lieu of using the code value. When typing out the name, be sure to get the upper and lower case exactly correct. In this example notice Name=”SourceText”. In this case, the filter value is: SourceText eq ‘Campaign’. The following shows the result in SAP Jam Collaboration. That’s it! 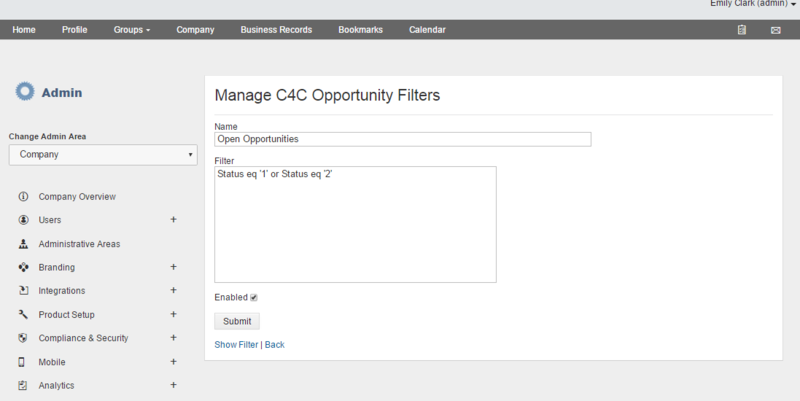 Please give this a try and let us know how you are using filters in SAP Jam!